I made a phone call to Kate, the administrator at SYEDA in Sheffield, the South Yorkshire Eating Disorder Association in regards to visiting in the next couple of weeks to ask some questions and gain some primary research for my dissertation. I used to be a patient under SYEDA for around 3 years, and feel I can happily go back as a recovered anorexic patient and would like to give them something back also. They have agreed a meeting with Mike the Charity Manager, and allowed me to write a survey for both patients and carers which can be filled in anonymously and sent back to me, in order to form a case study for my piece of critical writing. This will be invaluable research and a really good opportunity to talk to the charity as a recovered patient. I have also agreed in return for this help, to write a testimonial for them about their services which I am more than happy to do. Barbie and Ken, "Over the Years Campaign" as said by Kate, showing the change in body shape over time. I have since phoned the hospital at Seacroft, and as I had thought it will not be possible for me to go and speak to anyone due to privacy issues and the potential for discomfort of the patients, which I fully understand and appreciate. I came across this article whilst reading the latest news on eating disorders around the world, and clinical developments. The Daily Mail as always, are notorious for writing absolute rubbish in general, however with this article really offend those who have suffered from these illnesses. How can they say a clinically and scientifically proven mental illness be cured with a dose of antibiotics? Treating eating disorders like the common cold is one of the things which allows people to overlook the illness and disregard it, but is by no means to be treated with tablets alone, especially antibiotics, assuming it's a simply curable illness. In fact in takes years of therapy and self-help and recovery methods, and personally I am really offended by this article below. 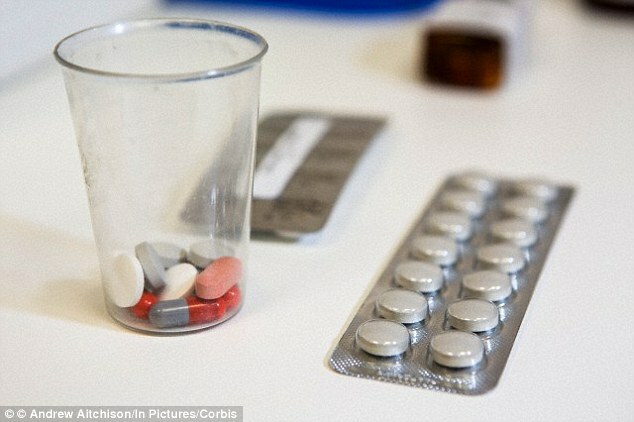 Anorexia and bulimia could be treated with antibiotics, scientists said They discovered a bacteria in the gut which stops body regulating hunger Antibiotics could destroy bacteria, allowing patients to regain appetite. Until now research has focused on the psychological triggers Around 5 % women and 2% men are affected by serious eating disorders. Breakthrough was welcomed by mental health charities. Scientists found bacteria in the digestive system that could cause eating disordersAnorexia and bulimia might be effectively treated with antibiotics, scientists have suggested.Experts have discovered a bacteria in the gut which stops the body from effectively regulating appetite. Although psychological and genetic factors are a major cause of eating disorders, doctors think that by tackling the physical factors, they may be able to help bring down rates of the problem. Serious eating disorders such as anorexia, bulimia and binge-eating disorders affect an estimated 5 per cent of women and 2 per cent of men. And scientists think up to 20 per cent of the population experience less serious eating disorders at some point in their lives. Until now research has focused on the psychological factors which trigger eating disorders. But a French team claims to have unveiled the digestive problems which underpin and perhaps even amplify the mental aspects of the disease. Academics at the University of Rouen and Inserm - the French national research institute - found that certain bacteria in the digestive system interfere with the way the body regulates appetite. They have demonstrated that their theory works in mice, and early research suggests it may also apply to humans. If further tests demonstrate their theories are correct, a single course of antibiotics could be used to destroy the problematic bacteria, allowing patients to regain a normal appetite. PreviProfessor Sergueï Fetissov, whose research was published last night in the journal Translational Psychiatry, said there is some way to go until a treatment is developed.But he added: ‘Theoretically, we could use selective antibiotic treatments to approach this. ‘We would have to know which different bacteria is affecting each individual, but if we know that we could choose the relevant antibiotic which works, and if it does not exist yet, we could develop it. Professor Fetissov’s team found that some forms of bacteria produce a protein called ClpB. When the body’s immune system recognises the protein, it produces antibodies which attacks it. But then problems can arise - because the ClpB protein is almost identical in form to a hormone which regulates appetite, called melanotropin. The antibodies which attack the protein also latch onto the hormone, meaning the body no longer knows when it should be full. In people with anorexia - a severe problem which leads to chronic undereating - the body feels it is full too early. In people with bulimia - who overeat and then make themselves sick - the body does not know it has become full until too late. In a study of 60 patients, the scientists found that those with eating disorders had higher levels of the antibodies produced to tackle the ClpB protein. A mystery remains as to how the physical functions interact with the psychological disorder, but Professor Fetissov thinks the two may be related. ‘There does seem to be a logical connection, when you think that the main risk factor for these disorders is stress,’ he said. He added: ‘We are presently working to develop a blood test based on detection of the bacterial protein ClpB. The breakthrough was welcomed last night by mental health charities. Mary George, of patient support charity Beat, said: ‘There is a great deal of evidence based research being carried out nowadays into eating disorders which are complex illnesses and generally multi causal affecting around 1.6 million people in the UK. I came across this documentary whilst reading food and media related articles online. 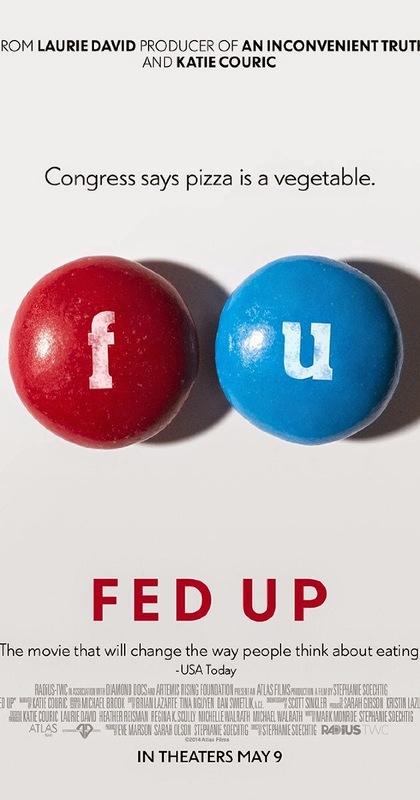 'Fed Up' is a documentary looking at the American food industry and the issues surrounding advertising, obesity and dieting. Even though this documentary doesn't touch the topic of Anorexia, Obesity is also a form of disordered eating and I found it totally different and opposite in terms of peoples thinking across different cultures where food is a prominent part of daily life. I found this contextually really interesting and a refreshing change from reading/watching documentaries on anorexia and bulimia, which has allowed me to be more understanding of those who suffer from obesity. The documentary also talks a lot about health, genetics, depression, media and social brainwashing which applies to my current practice and projects at hand. "For the past 30 years, everything we thought we knew about food and exercise is dead wrong. FED UP is the film the food industry doesn't want you to see. From Katie Couric, Laurie David, and director Stephanie Soechtig, FED UP will change the way you eat forever." The documentary can be found to watch online via this link. After presenting my COP3 presentation to the class, and to Richard and Amber yesterday, I have collated a list of questions prior to my first tutorial. As I am very ahead with this module, I was advised to be sure that the practical element fulfils its rationale by 110% and to ensure it is influenced by my practice. I feel as a designer interested in the fashion industry, and fashion related graphics, the influence from my other briefs I am currently working on, i.e. Jade Clark's Look Books will help with the layout design and overall aesthetics due to the image based editorial design. I also feel many of the books I have chosen to include on my reading lists for Extended Practice in terms of layout design and publishing design overlap with this module and will benefit me throughout the development of the layout. I am also hoping that feedback from the tutorial will help finalise the layout and the direction of the publication. I feel the answers from the questions below will help ensure the practical element is as suitable and appropriate as possible. - Is the body copy legible and readable? - Is it appropriately sized? - Is the layout appropriate to the format? - What is the overall aesthetic value portrayed as? - Use of layout and grid choices? - Overall format and execution - are these suitable, appropriate and fitting with the product/outcome/aims? - Is the design and information collated so far, suitable for the target audience? - Does the publication overall appeal to the target audience? - Does it fit the purpose/function/idea behind the book? - Does it clearly convey a change of body image/shape across the 20th and 21st centuries? - Is the context suitable? - Are the images suitable? - Does the book have enough context? - Are social, economical and cultural issues/topics covered thoroughly and relevant? An additional page has been added to the book, stating 111 celebrities and models, etc, who over the past 114 years have been titled or seen as the ideal beauty. I felt this added initial context and a connection with the reader at the hand, especially a younger, more youthful audience. Due to the original print quote for a foiled cover, I experimented with the design and ideas for this more. In regards to the cover I wanted to develop one which was highly visual and stimulating opposed to minimal. I feel it needs to have imagery add context to the name and its contents, as well as allowing the reader to engage with the book itself more at first instance. 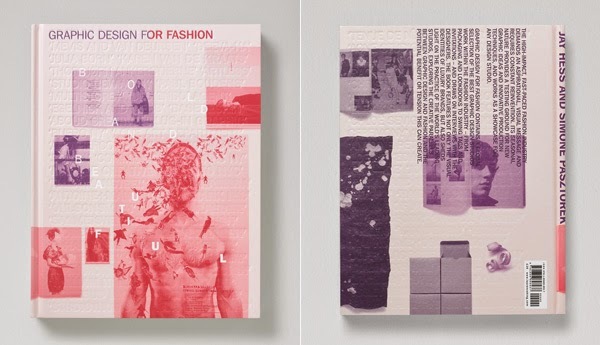 I was really inspired by the duotones of the images used on the Graphic Design for Fashion book. The cover can be seen below. I love the femininity crossed with subtle embossing, playful imagery and bright colour. This is something I wanted to carry out into my own practice for this book cover. I also like the displacement of the images with a slightly random undertone to the grid chosen. Below shows two different ideas I have for my book cover being inspired by the cover shown above for Graphic Design for Fashion. Both covers I have put together feature the same information - blurb, spine, title, yet have a different layout, colour scheme and overall aesthetic. Imagery collected during the research stages were used for both cover ideas, using different eras and decades to show a variety of body shapes and ideals on the second version. I also began experimenting with duotone images using a navy blue to compliment the background colour. Different colour backgrounds have been applied to the covers below allowing a variety of overall tones and aesthetics to choose from. Above: My favourite out of all of the covers and colour schemes, as its feminine without being obviously pink, and will still compliment the inner pages of the book. A very simplistic and minimal layout has been used throughout, featuring one image, per page, per year, and a summary for each decade. This was done to ensure that each year was very clear to the viewer as well as allowing the changes of the body to be noticed. I printed out copies of the book throughout the design process and bound these using a thermal binder for quick perfect binding. I wanted to produce A4-scale mock-ups to review layout, image quality, i.e. pixilation, colour, type face, type size and spelling mistakes, as well as the overall aesthetic. Due to printing marks from the black toner on the laser printer used, I re-printed the second mock-up to resolve this problem. This copy was then reviewed and then annotated with points to change, remove or add, etc. The mockups can be seen below as well as all of the changes to be made to the publication at this stage of the design process.